Express your Love with our Vase of Life – Love. Enjoy this beautiful bouquet of a dozen red roses for only $49.99! Your red roses will be wrapped with an extra touch of love, with our Infinite Links Forever Keepsake. After the flowers fade away, the links can be used on many home decor items. Simply adjust to use on candles, pottery, bottles, vases, plants, picture frames, and more! 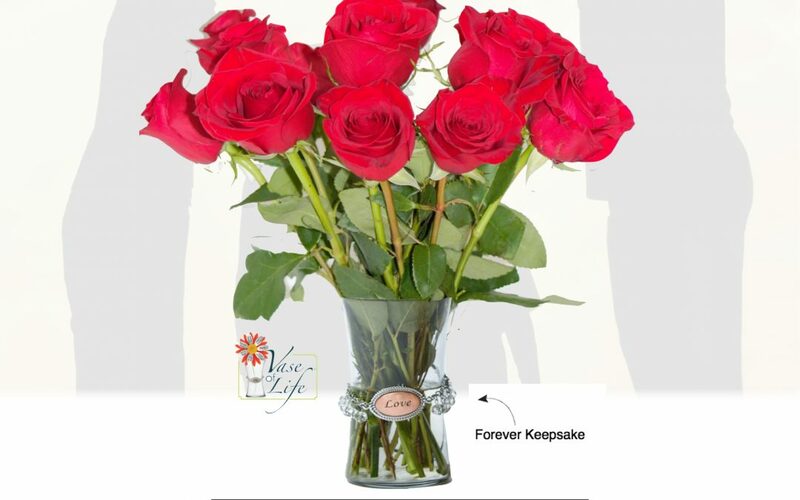 Your selection comes with a beautiful bouquet of a dozen red roses in our 7-inch Sweetheart vase, an Infinite Dangle Link, and the magnetic sentiment, Love. We recommend sending these beautiful flowers to an office, if there will be no one home to answer the door at a residence. The flowers are susceptible to extreme cold/warm temperatures.